San Marino is a country characterized by its architecture--namely, the three towers that adorn the country's flag and coat of arms. As a result, most of the San Marino tourist attractions center around the structures protruding from this tiny country's hill. As the third-smallest nation in Europe, it is surprising that San Marino managed to gain independence from robust Italy. This status has created great pride among the Sammarinese, although the surrounding Italian culture still plays a major role. And while its size has obvious disadvantages, the advantages for tourism strongly outweigh them. Visitors don't need to travel to get a sense of the nation (there isn't far to go! ), and it generates an intimacy and friendliness among locals that gets lost in most larger countries. Acquaviva: Acquaviva attracts visitors with its picturesque seaside beauty, where turquoise waters are surrounded by interesting rock formations. Another highlight of the region is the thrilling adventure park, equipped with towering obstacle courses including swinging nets and ropes. City of San Marino: Set in one of the smallest and oldest republics in the world, the City of San Marino serves as the nation's capital and hotspot for shopping and sightseeing. This city boasts World Heritage Site status due to its old town that features cobblestone streets and lovely views from its medieval churches and palaces. Dogana: If you're coming from Italy to your San Marino holiday, you will likely pass through Dogana, a small, relaxed town that is even free of the hassle of border formalities. The town boasts a few shopping centers offering international and local brands. Guaita: Perhaps one of the most popular San Marino places to see, Guaita is an 11th-century tower once used as a prison; it sits high above the city on its hilltop location. Palazzo Pubblico: Set atop Mount Titan is Palazzo Pubblico, a center of political business built with medieval architecture and an impressive clock tower adorned with coats of arms. Torture Museum: Although not an attraction for the squeamish visitor, this museum proves fascinating with its collection of ancient instruments of torture from the 16th to 19th centuries. Piazza della Liberta: Next to Palazzo Pubblico, this square is lined with cafes, restaurants, and small shops, all surrounding a white marble statue depicting freedom. Mount Titan: Boasting World Heritage Site status, this grassy mountain is the home of three ancient structures and several culturally important sites, making it a national symbol of San Marino. Museo delle Curiosità - San Marino: This collection of about 100 unusual displays, ranging from the world's heaviest person to the biggest newborn baby, makes an interesting stop in your San Marino itinerary. Cesta Tower: Set on Mount Titan, this 13th-century tower houses a museum dedicated to Saint Marinus, the first person to build on the mountain that was later to become an independent San Marino. Basilica del Santo Marino: Built during the 1800s, the city's main church features Neoclassical architecture with numerous paintings and statues, including ones dedicated to St. Peter and Pope John XXII. Museo di Stato: Enrich your San Marino Trip with local history through this museum's displays of nearly 5,000 items, including artwork, pottery, and more. While there may not seem to be much room to roam in San Marino, the kids don't have to be confined to one place during your San Marino vacation. 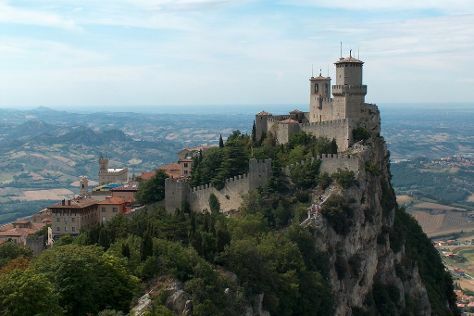 City of San Marino offers a ton of attractions to see and experience, including ancient castles, mountain hiking trails, a quaint old town, shopping centers, and much more. Encourage the kids to talk to the old town shop owners and ask questions about the area's history and products. If you're lucky enough to visit during July, children will love the annual Medieval Day, when the locals dress up in period costumes and hold events like crossbow competitions. For a day in the sun and sand, head to the region of Acquaviva, just next to the capital. Besides the beautiful rock pool where kids can cool off, the region also offers an exciting adventure park. Climb Mount Titan to explore ancient edifices like Guaita and Cesta Tower, where young travelers can clamber up the stone structures and let their imaginations run wild with thoughts of knights and kings. Do not miss Museo delle Curiosità - San Marino for a fascinating collection of strange cases from all over the world, and consider stopping by Museo di Stato to educate children on the region's history. If souvenir shopping is the goal, try the small shops in City of San Marino's old town for artwork, toys, clothing, and more. Once the kids get tired of being indoors, head to Acquaviva to spice up your San Marino itinerary. This exciting region offers aquamarine waters in a pool surrounded by rocks, making it the perfect place to take a dip. Just remember to apply sunscreen regularly, as the sun is stronger than it feels here. The whole family will enjoy San Marino Adventures, an adventure park with a thrilling ropes course. A ticket into this park grants visitors access to a variety of activities. Explore 24 different adventure trails in varying difficulty levels featuring zip lines, bridges, tunnels, rope nets, and more. All trails are overseen by professional and experienced instructors. Elsewhere in the park, test your aim at Robin Hood's archery school or pet the delightful animals at the pony ranch. Natives in San Marino typically love children, so be prepared for locals wanting to pinch your kid's cheeks and give them a treat. Fortunately, this adoration for children often leads to free admission or discounted ticket prices at popular tourist attractions, so be sure to inquire at the entrances. Your holiday in San Marino is sure to be a tasty one, as food is a celebrated part of life in this nation. Its Mediterranean cuisine includes locally grown and produced vegetables, meat, and pasta with a similarity to the Italian Romagna region. For a traditional meal, ask for "faggioli con le cotiche," a dark bean soup flavored with bacon and traditionally prepared at Christmas, or "pasta e cece," a soup of chickpeas and noodles flavored with garlic and rosemary. Some of the best food is found at family-owned restaurants with outdoor seating in the summer. Instead of shopping in Italy, make its neighbor's small shops part of your San Marino itinerary to save money with the lower tax rates. Natives and locals alike prefer shopping for clothing, shoes, beauty products, electronics, and wine in San Marino as opposed to surrounding countries. More original buys are found in the old town of City of San Marino, like hand-painted ceramics, lace, and artwork. Founded in 301 CE, San Marino boasts a long and rich history. During your San Marino tour, locals will tell you an old story about a Christian stonemason named Marinus who first lived on Mount Titan, and for whom the country is named. Today, several ancient structures are dedicated to the stonemason, including Cesta Tower. Despite its small size and many invasions from enemy territories, San Marino retained its independent status, which was first officially recognized in 1291 by Pope Nicholas IV. Surprisingly, San Marino only consisted of the single mountain until 1463, when Pope Pius II gave the territory several more towns, increasing its size slightly. Aggression has visited the country only two times since then. The first incident occurred in 1503, when Duca Valentino occupied the territory until the Pope's death, and the following unrest forced his troops out of San Marino. The next invaders came in 1739, when Cardinal Alberoni occupied the country in an attempt to gain more political power. This worked against the Cardinal, however, as disputes between him and the Pope only progressed San Marino's rights and restored independence. Since 1862, San Marino has developed an official treaty of friendship, revised several times, with Italy. Natives of San Marino remain proud of their freedom and history. One example of this pride is the Statue della Liberta in Piazza della Liberta, a white marble monument symbolizing the country's liberty and rights. Do not miss a trip to this square to see the impressive statue and admire the culture influenced by centuries of heritage. Etiquette in San Marino follows that of its Italian neighbor, and visitors on a San Marino vacation are encouraged to keep dining customs in mind. When eating with others, wait for the host or hostess to seat themselves before taking your own seat, and do not leave the meal until the host or hostess does. It is also polite to keep your hands visible during the meal, without resting your elbows on the table. Also try to dress nicely while sightseeing, as making a good first impression is highly valued in San Marino culture. Despite its small size, San Marino boasts its own collection of exciting festivals. Try to plan your San Marino holiday in July, when Medieval Day is celebrated by dressing up in costumes and reliving old times. Shop owners in the historical old town of City of San Marino put on medieval outfits and offer special products; meanwhile, several period events are reenacted, like the crossbow competition in the main square. On September 3, join in the feasts celebrating San Marino's Day and the establishment of the republic, all topped off with fireworks at night. Any time is a good time to tour San Marino, because the mild weather stays generally warm and sunny. If you plan on visiting during winter months, however, be aware that rain is much more common during this time and take along rain gear. The nation's small size allows tourists to easily experience all of San Marino's places to visit, but also means a limited amount of transportation methods are available. Taxis are always available and can be quickly hailed in towns, or you can opt to take control of your own travel and rent a car. Limited bus networks run between City of San Marino and Rimini. San Marino harbors two official languages, standard Italian and a Sammarinese dialect. While most people can speak both, standard Italian is used in daily affairs with a smattering of Sammarinese words and phrases. If you speak Italian, however, communicating should not be a problem. Tipping is not required in San Marino but is appreciated for excellent service at nicer restaurants or hotels--although occasionally the bill includes a service charge. Customarily, 5 to 10 percent is appropriate if you decide to tip.